They want two paid days off per year that could be rolled over if not used. Currently sick days are unpaid, as are snow days and holidays. The union is asking for a small pay raise. 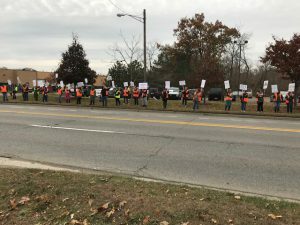 In addition, the drivers are objecting to a Durham contract offer that would require them to pay 100 percent of health care costs. MEA member Lance Williams told the Oakland Press that bus drivers’ pay and benefits do not reflect the ongoing training they undergo or the responsibility they take on. The district’s transportation services were outsourced to Durham five years ago. The out-of-state company has been difficult to get to the bargaining table, said MEA UniServ Director Cyndi Austin. A session scheduled for next Wednesday is the first since September, she said. Drivers in the MEA unit are again planning to conduct informational picketing next Tuesday in advance of the talks. 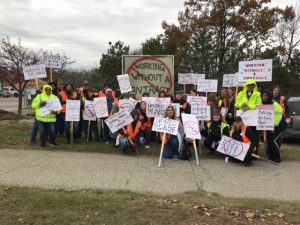 See more coverage of the picketing in West Bloomfield.